When was the last time you helped a friend in need? 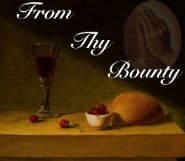 Even more profoundly Christian: When was the last time you helped a strange in need? Growing up this was my favorite station and this was the same image I loved to look at in our family Bible. Perhaps it was because Veronica represents the image of thousands of women who wipe the brows of their family members. Perhaps I loved it because it was the ideal of being able to do something physical for Christ. Perhaps I loved it because it showed a woman trying to serve in humble servitude, something I have always struggled with. Perhaps I loved it because the image spoke of the things women do within the home that are so valuable to all...like laundry. The next load of laundry you place in your machine, offer a prayer of thanksgiving for your family. For each article of clothing you fold this week, say a prayer for that beloved. A brave smile in the mist of defeat. Another little girl found the coveted golden egg. But, I must say, Annie admirably reigned-in her highly competitive spirit and was a very good sport. Sorry for the Annie-overload but she is my baby and she's growing up so fast. I'm realizing how fleeting these "picture-perfect" moments are. One of Annie's little friends came into the house today for some water. As I was getting her a cup she told me, "I just loooove Annie. She's so much fun. She's hyper and funny and lots of fun and likes horses too." "And..." She paused to sip her draft of water and wipe her mouth on the back of her sleeve. "...she's bossy too. Just like me." Kids always have the best punch lines. How many times have you fallen in life? How many times have you not been the wife and/or mother that you wanted to be? How many times have you fallen failed to follow through on projects and tasks? How many times have you felt as though you could not get up one more morning, one more day? How many times have you felt as though you could not rise up to the duties in your state of life? 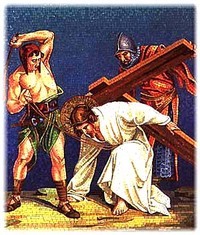 Lay all your failings and your falls at the foot of the cross. Padre Pio taught that all people should approach the altar in church as though they were approaching the hill of Calvary to join Mary at the blood-stained base of the cross. 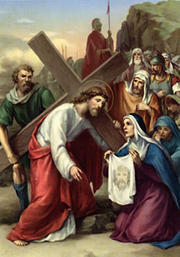 Join Mary at the foot of the cross...and remember that Jesus has redeemed all your shortcomings. He has already lifted them up. There is no reason for you to stay down in the dirt, beaten and alone. He has shown you how to rise and shoulder your cross. Through His Resurrection, He wills you to rise up. Do not stay down. Take up your cross and rise. As Christians, we have faith. Rise with faith. And follow Him. Perhaps the most poignant station of all. An injured, bleeding child approaches his mother. The mother sees her child rejected and shunned by others. We see her eyes. We know those eyes. They are the eyes of a mother...the windows of the heart. A thousand mothers...nay, ten thousand times ten mothers...have echoed the same picture. Our child runs to us with a tearful face. Our child's rigid hand catches his fall off his bicycle and a shattered stone cuts into his tender palm. Our teenager paces restlessly through the house, searching...wanting to approach and not wanting to approach. Our little princess' eyes well-up with tears because of the gossip and cattiness of others. We kissed the tear-stained cheek. We clean and bandage the cut. We offer a sympathetic smile to the teenager and perhaps finger a lock of hair off the worried brow. We hug the little girl who too soon turns into a little lady and we give her our undivided attention. We would rather take their suffering upon our own shoulders than see our child in pain. At some point today, a child has approached you. How did you receive Jesus in that child? Did you turn, as Mary did, to your child and cup his chin in the palm of your hand? Did you lean towards him and give a listening smile? Did you crease the chocolate-smudged cheek? Did you look into your child's eyes with such intensity that you could see her soul and count her heartbeats? Did you nurse a sick child today? Did you pray over a hurting child today? Did you listen? Did you really, really, really listen to him speak? Did you block out the other noises within your world and listen to the heart that you gave him? Did you look at her? Did you really, really, really look at her and realize that in one brief instant, she could be taken away from you? Did you think about the child who is lost to you, in any number of ways that children can be lost to their parents: death, kidnapping, drugs, unfavorable companions? These children might not be in your arms right now, but they are in Mary's arms. 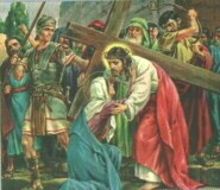 She receives them just as she received her son Jesus on His walk to Calvary. She holds your child in her arms now. Entrust your child to Mary. She will bring him to her Son. Now you must leave that child, knowing he is in the most caring, loving arms (besides your own). You must let go of that little hand and shoulder your cross a little more bravely to follow Christ the remainder of the way up that long winding hill towards salvation. We do not like the walk. We do not desire the walk. We do not welcome the walk. It is a path that only mothers know and that only mothers can walk. We are thankful that Mary walked it before us. We have learned how to walk the path because of her example and her grace. This post has been corrected and completed. Sorry about the first post. That will teach me never to try posting a meditation (that "spoke" to me during my reflective time) 30 minutes before leaving for a National Championship game. Dear me! What was I thinking??? This hymn is taken from my Magnificat on the morning of Saturday, March 14, 2009. I think it is a most beautiful, soothing, compassionate poem that gives Compassion the footsteps and the name and the mission we are all called to follow. Because the heart that leads is blind. To lead them to a warmer land. And shoulders those too weak to stand. For those that only love would seek. And heals all ills and stills all pains. Where God is all, and all is peace.